Miyama is back! And this time we have a new female lawyer for him to blanter with! Maiko used to work as a judge, and she has a completely opposite viewpoint of Miyama when it comes to criminal cases. Faced with seemingly insurmountable evidence, she advised the defendant to plead guilty in exchange for a more lenient sentence. On the other hand, Miyama is resolute in his quest for the truth, and forges ahead to find the one truth. He wastes no time on considering the welfare of his clients – the truth is all that interests him. So the first episode of season 2 aired last Sunday… I’ve been looking forward to it since the announcement of a second season last year. I love the detective like nature of the show – solving mysteries are my thing. With a great cast and a delightful mix of jokes and truth finding, and a great overarching mystery (Miyama’s mysterious background, and what happened to his dad), season 1 kept me constantly on my toes. The first episode of season 2 certainly did not disappoint! Miyama has a new opponent to deal with now that Maiko has replaced Tachibana on the team. Even though it’s just the first episode, new mysteries have appeared and I’m sure rest of the episodes will see the fog on these overarching mysteries slowly lift. There were plenty of references made to the first season, but if you’ve not seen the first season, you can definitely jump in. While you might miss some references, I’m sure these references will eventually be re-explained in the later few episodes, as the mysteries reveal themselves. The main episode plot though is pretty much a standalone. You’ll pretty much see a new case/client every episode, and watch our lawyers play detective to find out the truth about the case. As such, no background knowledge of the show/the first season is necessary, though for full enjoyment of the show, I’d definitely recommend watching season 1 first! I’m really looking forward to finding out more about the new character Maiko! She’s a former judge, and it seems like a case ruling left her traumatized, and she quit and distanced herself from the position. Apparently to be a judge, you need to be in the top 30% of the cohort. So what made this high flyer quit her role? Will she be able to get pass her bias against the defendants? Does she have any family? I have a guess that the teenage defendant shown in the cut scenes is someone she personally knows… Or her son even? o.o I guess we’ll have to wait for the season to pan out to know! As for Miyama, it seems like we’ll find out the truth about his dad soon enough! This Sunday in fact! Finally, the mystery that has been bugging us all of season 1 will be solved! However, this does not mean that Miyama has given up all his secrets though! 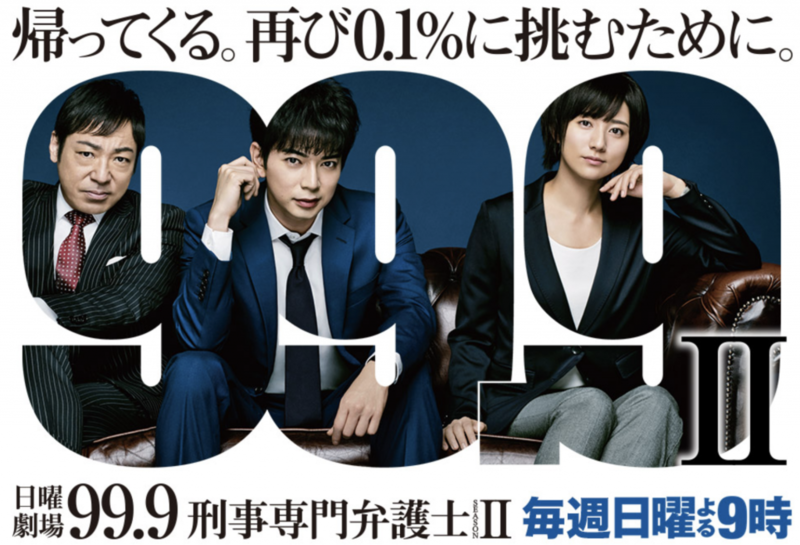 In fact, quite the contrary… Right at the beginning of the drama, Miyama pops into a taxi and is joined by Maiko, who chatters on and talks about how rumors are passing around the judges that a certain Fukayama is giving them plenty of headache. Turns out that Miyama is the said ‘Fukayama’. The ending scene shows Miyama introducing himself as ‘Fukayama’ to another judge. Some background. Miyama is written as 深山. An alternative pronunciation of the kanji is Fukayama. So what’s with this Fukayama is why is Miyama purposely introducing himself as such? There’s definitely more than meets the eye and I can’t wait to find out! Overall, I believe this season will be a good as the first (don’t disappoint me please! ), and I can’t wait for episode 2 this Sunday! Hopefully I’ll get to watch it live on TV in Japan! Yup! I’m flying off to Japan tomorrow night. In exactly 24 hours in fact! I’m sure I’ll have more to share on that next time!